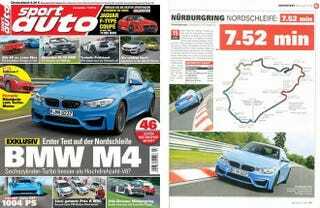 German magazine Sport Auto is the closest thing there is to an independent Ring Time officiator, and they reportedly clocked the new BMW M4 at 7:52. Not bad, right? Turns out that back in the day they ran an E46 M3 CSL around at just 7:50! It's impressive, I suppose, that the M4 can run almost up to the CSL's time with all of the leather, soft suspension, and road-usable tires you get nowadays. I mean, take an M4 to a track and you won't have a bad time, but still, I know which car I'd want.